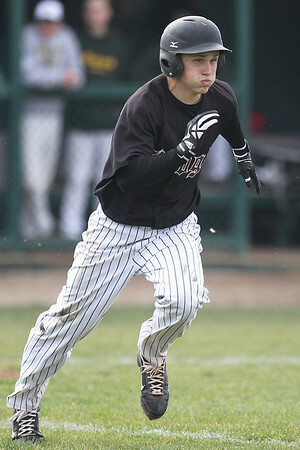 Mike Greene - mgreene@shawmedia.com Prairie Ridge's Mike Reitcheck hustles to first base while trying to beat out an infield single against Crystal Lake South during a game Tuesday, May 1, 2012 in Crystal Lake. Crystal Lake South won the game 2-0. 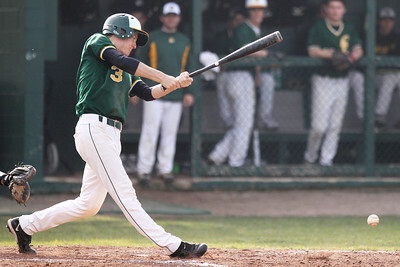 Mike Greene - mgreene@shawmedia.com Crystal Lake South's Dom Winiecki focuses while batting with two runners on in the bottom of the fifth inning against Prairie Ridge during a game Tuesday, May 1, 2012 in Crystal Lake. 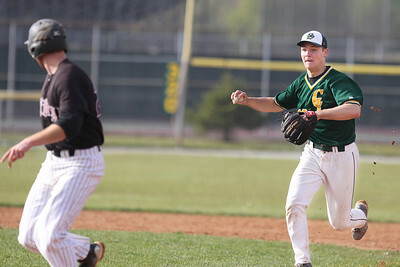 Winiecki drove in one run on a single and helped Crystal Lake South win the game 2-0. Mike Greene - mgreene@shawmedia.com Crystal Lake South's Jordan Van Dyck makes his way back to first base safely after a failed bunt attempt as Prairie Ridge's Lucas Keller defends the base during a game Tuesday, May 1, 2012 in Crystal Lake. Crystal Lake South won the game 2-0. 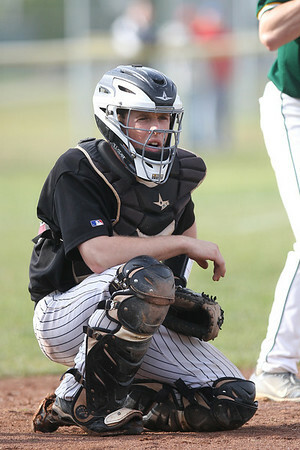 Mike Greene - mgreene@shawmedia.com Prairie Ridge's Matt Krenz looks to his bench for a pitch call during a game against Crystal Lake South Tuesday, May 1, 2012 in Crystal Lake. Crystal Lake South won the game 2-0. 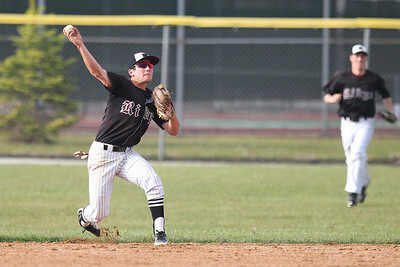 Mike Greene - mgreene@shawmedia.com Prairie Ridge's Kyle Hodorowicz makes a play on the ball during a game against Crystal Lake South Tuesday, May 1, 2012 in Crystal Lake. Crystal Lake South won the game 2-0. Mike Greene - mgreene@shawmedia.com Prairie Ridge's Corey Peterson becomes air-bound while throwing to first base during a game against Crystal Lake South Tuesday, May 1, 2012 in Crystal Lake. Crystal Lake South won the game 2-0. 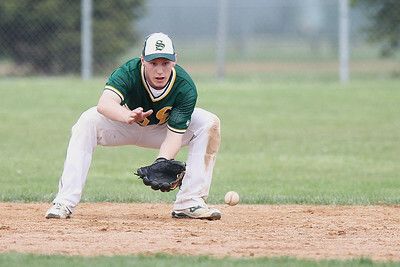 Mike Greene - mgreene@shawmedia.com Crystal Lake South's Tyler Salm looks a ball into his glove during the top of the seventh inning in a game against Prairie Ridge Tuesday, May 1, 2012 in Crystal Lake. Crystal Lake South won the game 2-0. Mike Greene - mgreene@shawmedia.com Crystal Lake South's Zack Geib pitches during the seventh inning of a game against Prairie Ridge Tuesday, May 1, 2012 in Crystal Lake. 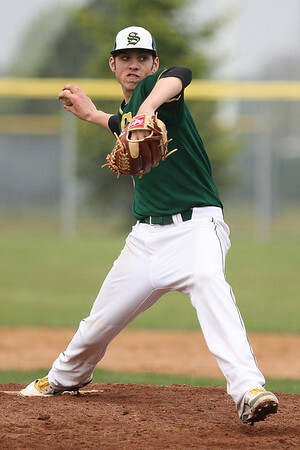 Geib pitched a complete game shut out as Crystal Lake South won the game 2-0. Mike Greene - mgreene@shawmedia.com Crystal Lake South's Zack Geib pitches against Prairie Ridge during a game Tuesday, May 1, 2012 in Crystal Lake. 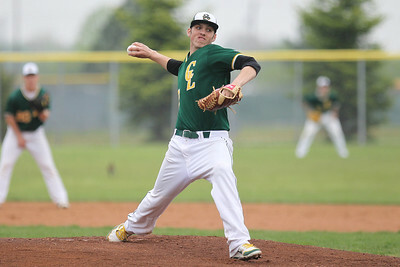 Geib pitched a complete game shut out as Crystal Lake South won the game 2-0. 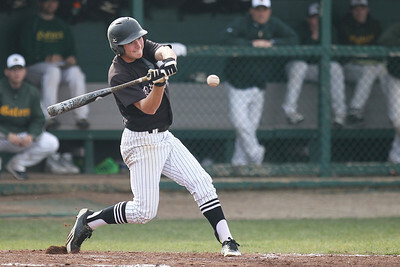 Mike Greene - mgreene@shawmedia.com Prairie Ridge's Kyle Hodorowicz swings at a pitch while playing against Crystal Lake South during a game Tuesday, May 1, 2012 in Crystal Lake. Crystal Lake South won the game 2-0. 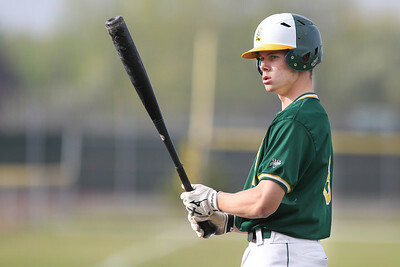 Mike Greene - mgreene@shawmedia.com Crystal Lake South's Will Ahsmann hits a ground ball while leading off the bottom of the fifth inning during a game against Prairie Ridge Tuesday, May 1, 2012 in Crystal Lake. Ahsmann beat out an infield single on the play and later scored the Gators' first run of the game. Crystal Lake South won the game 2-0. 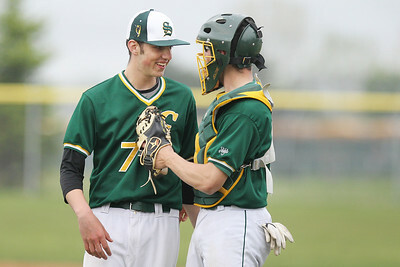 Mike Greene - mgreene@shawmedia.com Crystal Lake South's Zack Geib (left) and Dom Winiecki celebrate after defeating Prairie Ridge in a game Tuesday, May 1, 2012 in Crystal Lake. Geib threw a complete game shut out, leading Crystal Lake South to a 2-0 victory over Prairie Ridge. 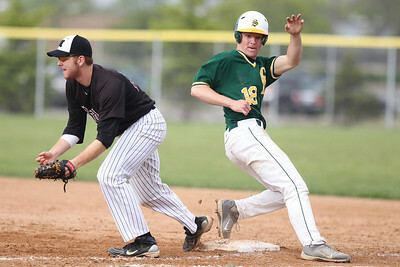 Mike Greene - mgreene@shawmedia.com Crystal Lake South's Jordan Van Dyck (right) chases after Prairie Ridge's Lucas Keller during a rundown in a game Tuesday, May 1, 2012 in Crystal Lake. Crystal Lake South won the game 2-0. 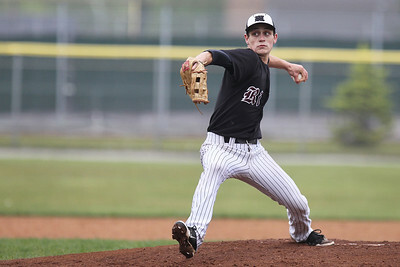 Mike Greene - mgreene@shawmedia.com Prairie Ridge's Tyler Tennant pitches against Crystal Lake South during a game Tuesday, May 1, 2012 in Crystal Lake. Crystal Lake South won the game 2-0. 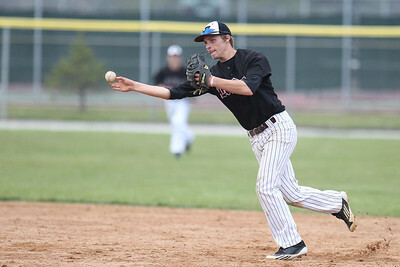 Mike Greene - mgreene@shawmedia.com Prairie Ridge's Brad Schillinger throws towards first base during a game against Crystal Lake South Tuesday, May 1, 2012 in Crystal Lake. Crystal Lake South won the game 2-0. 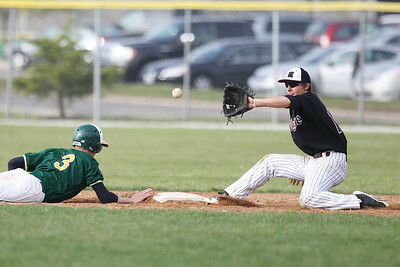 Mike Greene - mgreene@shawmedia.com Prairie Ridge's Brad Schillinger waits for the ball during a pick off attempt as Crystal Lake South's Will Ahsmann slides into second during a game Tuesday, May 1, 2012 in Crystal Lake. Crystal Lake South won the game 2-0. 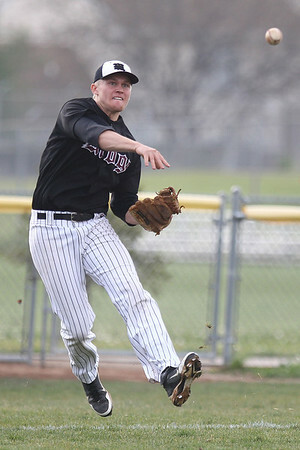 Prairie Ridge's Corey Peterson becomes air-bound while throwing to first base during a game against Crystal Lake South Tuesday, May 1, 2012 in Crystal Lake. Crystal Lake South won the game 2-0.